Curved lines and intricate patterns define the exclusive designs of Waterjet Mosaics. These special tiles are designed in house and custom tailored to work with all of our beautiful stone collections to complete your look. 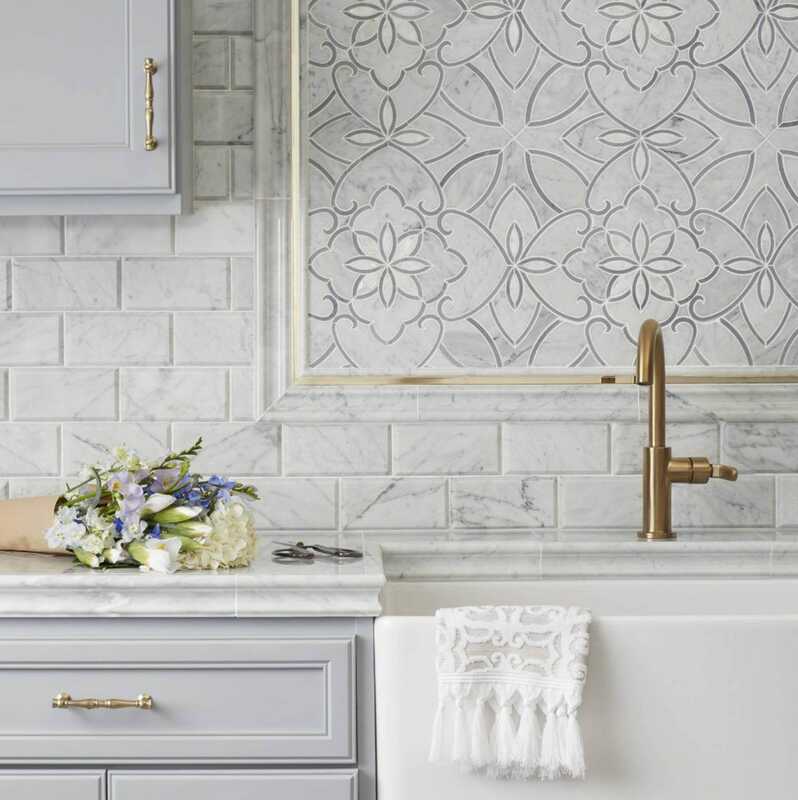 With 50+ patterns created by Brandy Janke, Tile Shop product designer, we will explore the interesting design features that accompany these mesmerizing mosaics. A unique manufacturing process is required as it is not possible get these interesting, unique and curved shapes from traditional cutting methods. A computerized machine that has multiple heads uses a high pressured stream of water mixed with fine sand particles to cut through the stone. The cutting technique uses as much of each piece of stone as possible, which is another reason we absolutely love these exquisite mosaics. After the cuts are made, the individual pieces are collected, cleaned off and set aside to dry before being assembled by hand into the final mosaic pattern. To get a glimpse into this unique process, check out the video below! These versatile mosaics can be used on the floor or wall and are typically made of stone. Unlike the majority of mosaics, however, the waterjet cutting process gives the option of curved or softer lines while promoting sustainability by using the most of each material. The photo below featuring Monroe Marquina displays the intricate details of these beautiful mosaics. Choose from various options with Waterjet Mosaics that mix materials such as glass, metal and natural stone as well as rare, highly sought after materials such as mother-of-pearl, moonstone and more. From dainty flowers to geometric shapes, colorful patterns to monochromatic designs, the possibilities are endless with our growing selection of Waterjet Mosaics. 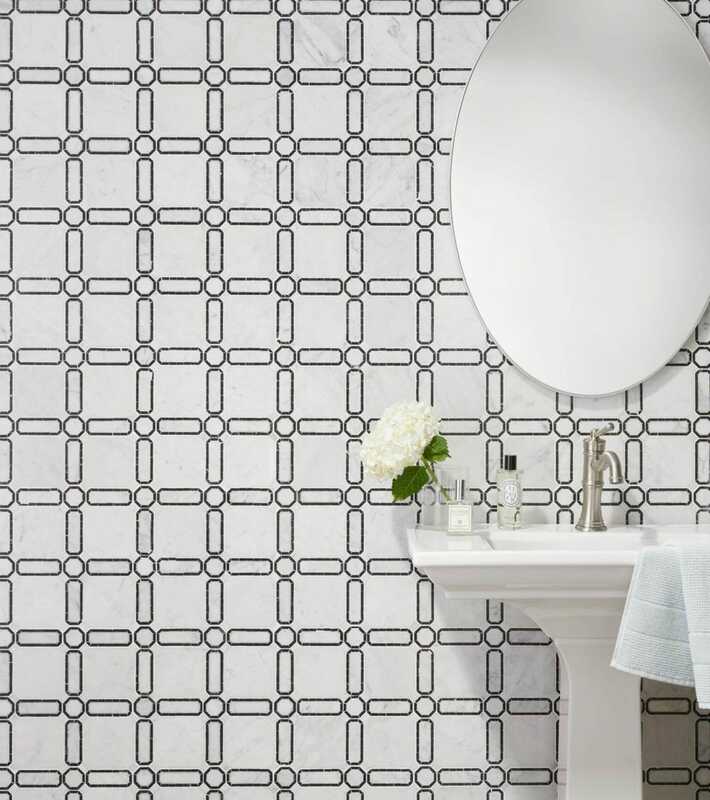 Read on for our favorite distinct ways to design with these game-changing tiles. Cover your walls from floor to ceiling with these one-of-a-kind mosaics to replicate the look of wallpaper. 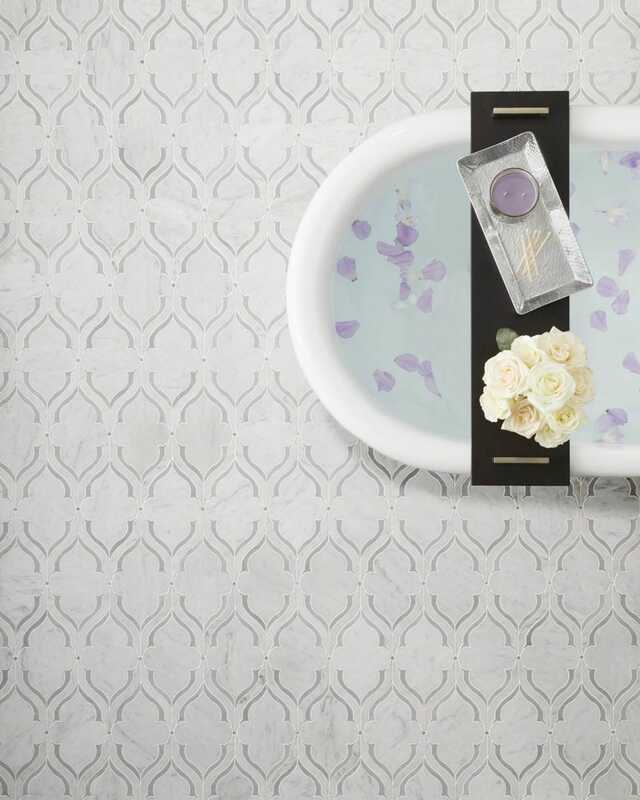 Unlike wallpaper, tile provides a durable option for wet areas while allowing you to be bold in your design. 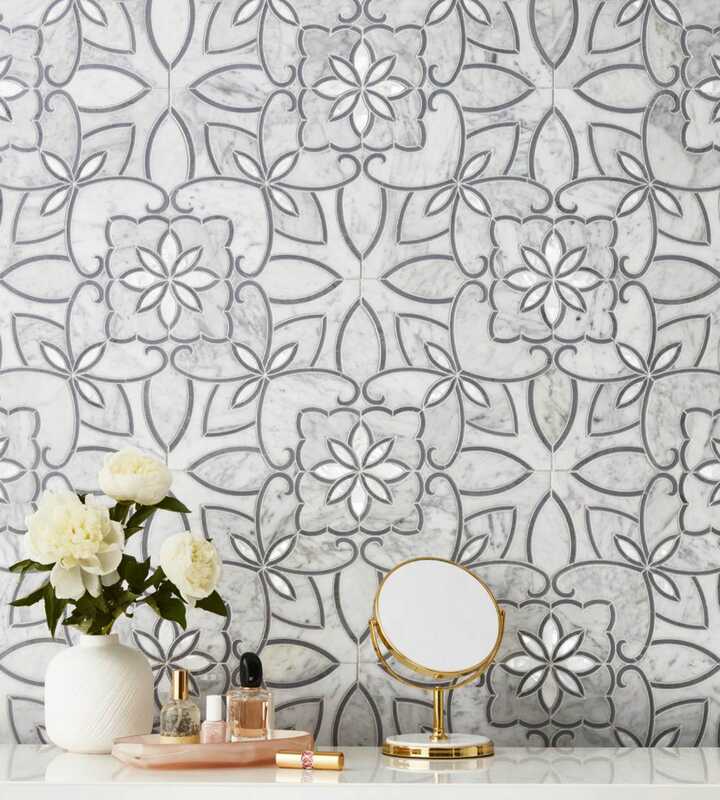 Display seamless, feminine florals using Waterjet Mosaics as an accent wall in a powder room, as seen below featuring Havana w/ White Mother-of-Pearl. The curved lines and dainty details are a staple style for waterjet mosaics. 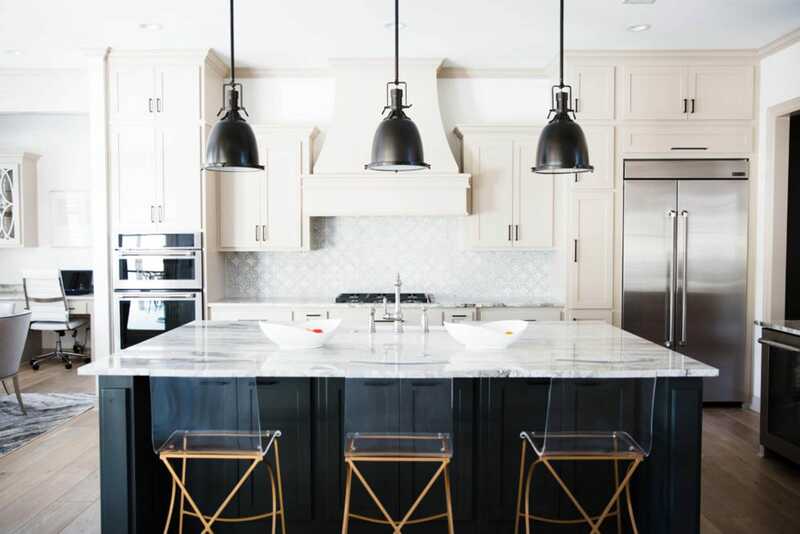 Take notes from this transitional kitchen by Morrissey Home Solutions to create a breathtaking backsplash that perfectly compliments the rest of this stunning space. Waterjet Mosaics can take on all types of shapes and forms. 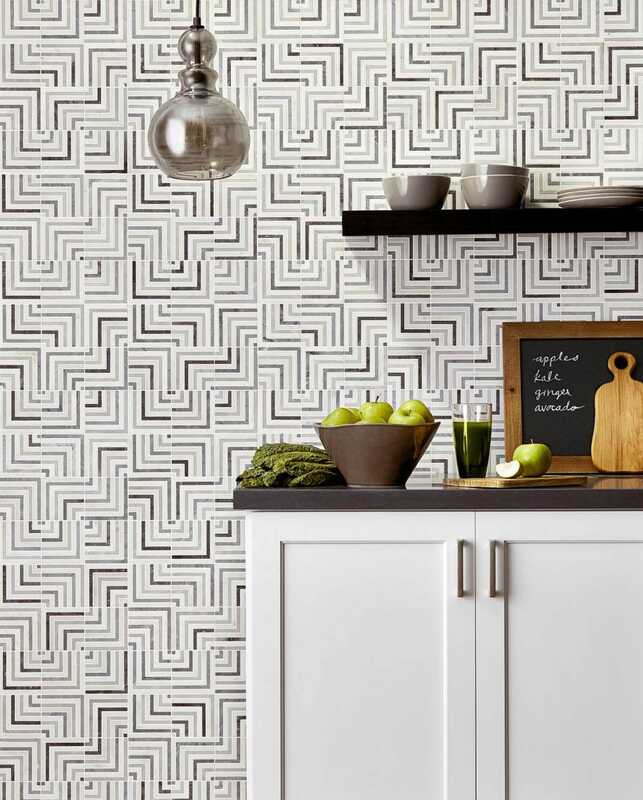 Discover a more masculine take on a kitchen accent wall with Victoria Grey Meander displaying straight lines and a strict structure similar to a hypnotic maze. 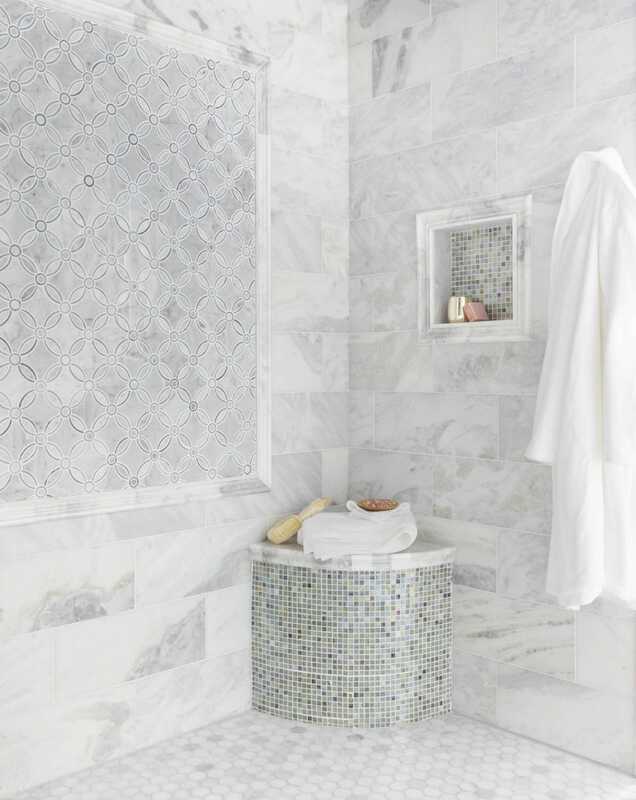 Opt to give your bathroom a stunning pop with a detailed Waterjet Mosaic fit to your individual flair. Clean and simple, you’ll be sure to love the detailed design patterns of these captivating tiles displayed on your floor. 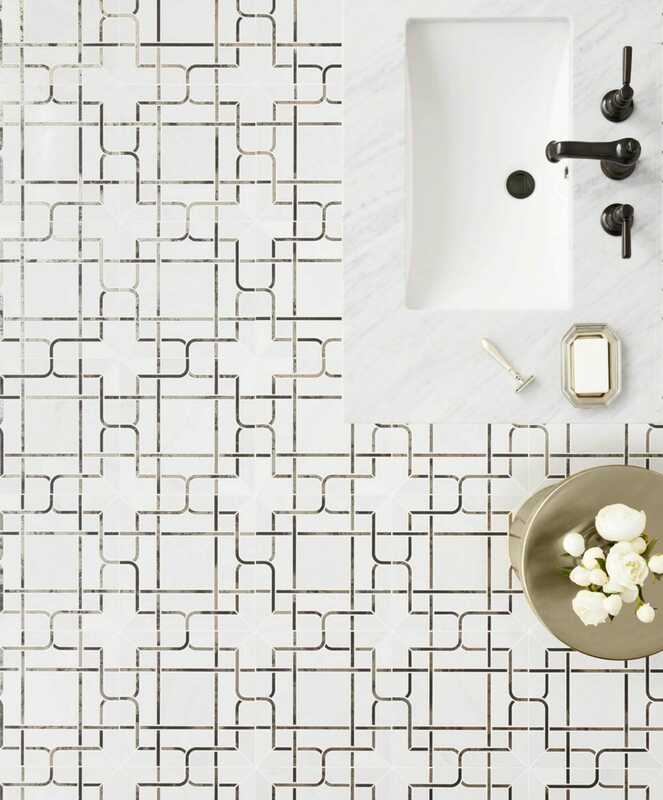 Waterjet Mosaics are a dazzling option for the entire floor of a bathroom. Fill the whole space with unique patterns or choose to frame the mosaic with coordinating stones to create a rug look, drawing all eyes to your desired mosaic. Give any room a distinct personality with an exceptional Waterjet Mosaic pattern guaranteed to bring that wow factor to an artfully detailed floor. Wainscoting is typically referred to as the covering of the lower half of a wall using wooden paneling. Integrate a modern take on wainscoting by using an accent tile on the top half of your wall and a coordinating tile on the bottom half for style and warmth. 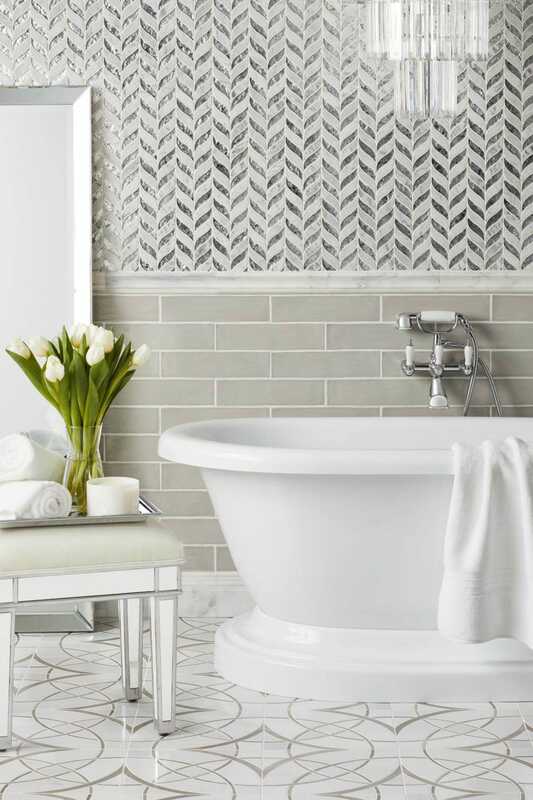 The photo below features a softly curved chevron waterjet mosaic achieving a wallpaper effect on the upper half of the wall, and subway tile wainscot on the bottom half. These universal tiles are highly mixable, so don’t be afraid to mix and match with materials other than stone, such as glass or porcelain. Layer in the details and watch your living space come to life. 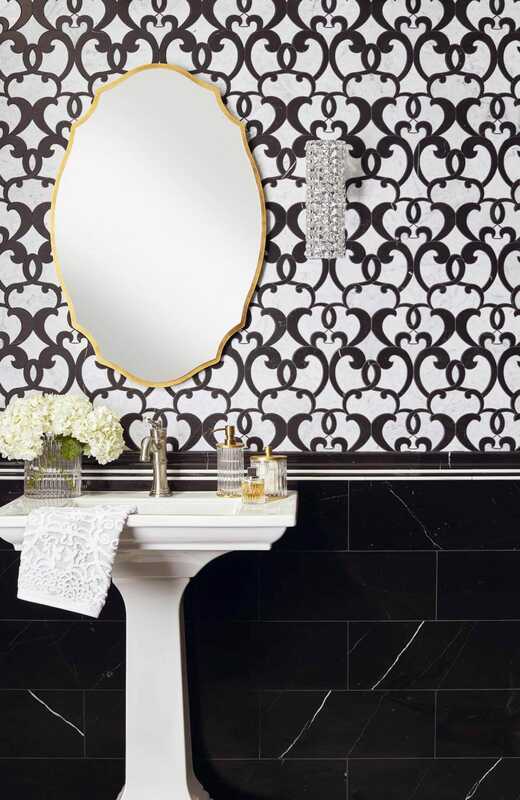 This Monroe Marquina vanity splash is a style we love: beautiful and bold! 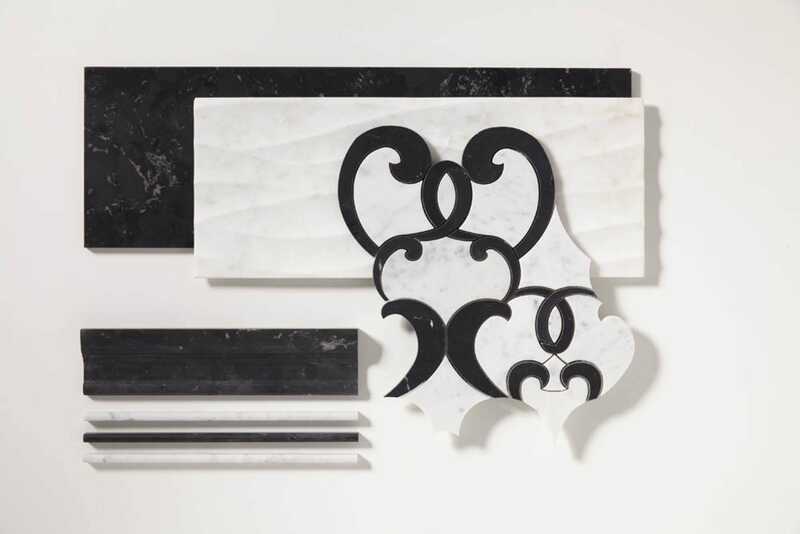 Transition from one tile to the next with our custom trim pieces, using profiles with black and white to give an accentuated pop of color. 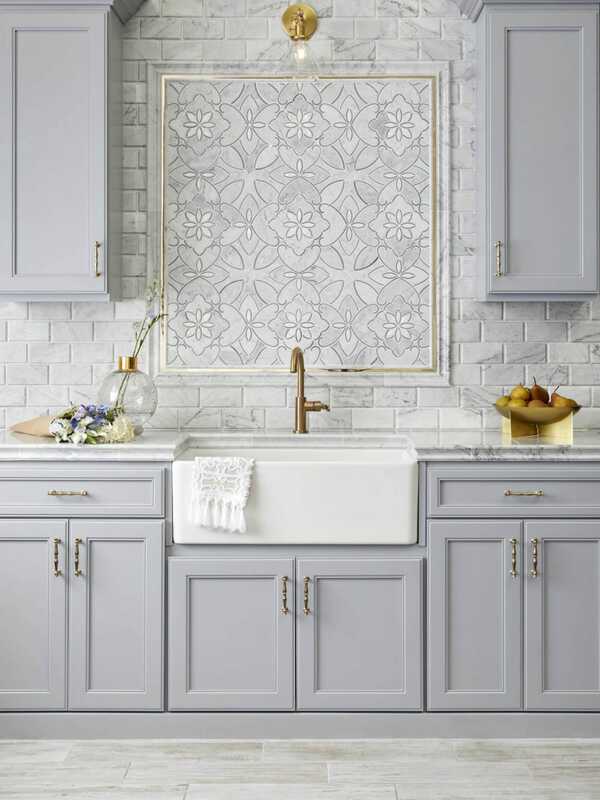 Explore more Waterjet Mosaic ideas by using these distinct tiles either above or below a wainscot. Use Waterjet Mosaics inside of a picture frame design to add detail and create a focal point in your custom space. Not sure which one to choose? Work with one of our design associates for a free consultation. 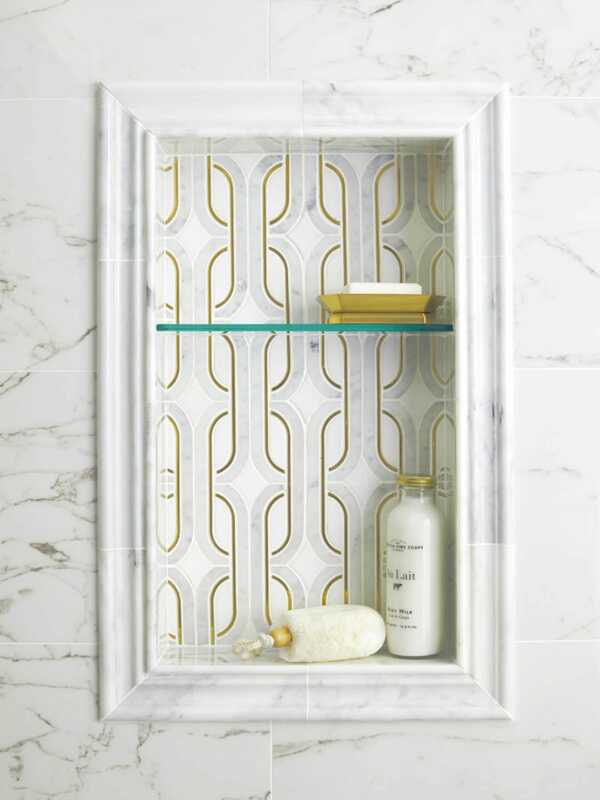 Experiment with Waterjet Mosaics in the form of a recessed shelf for a smaller custom feature that still packs a glamorous punch. 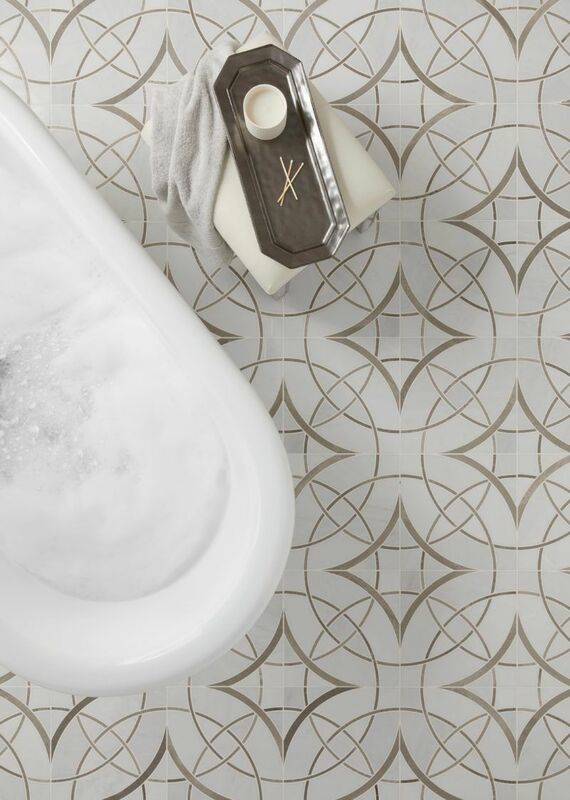 The Moderne Deco mosaic featured below is a nod to the art deco look with touches of brushed gold and cool-grey marble. Whatever design style speaks to you the most, it is essential to thoughtfully consider how to best feature these unique, intricate statement tiles. From subtle to a standout pattern, these elaborately custom tiles can bring beauty into any space of your home. Amazed with the options and various design styles of Waterjet Mosaics? Find more unique Waterjet Mosaic shapes and patterns at your local Tile Shop or explore the custom selection online.